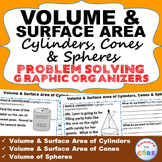 Surface Area of cylinders, cones, and spheres. This powerpoint shows how to find the surface area of cylinders by using both the net and the formula. 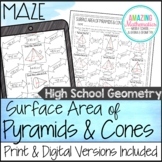 It also shows how to use the formula to find the surface area of cones and cylinders. 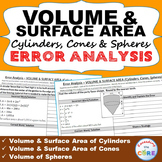 Shows how to find surface area of cylinders using both the formula and net. 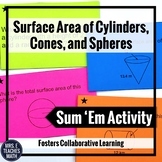 Shows how to find surface area of cones and spheres by using the formula. This powerpoint does have a St. Patrick's day theme. Students love foldables for notes! 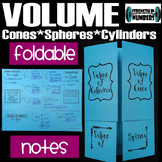 This one covers volume of cylinders, spheres, and cones. These could easily be cut in half to do volume and surface area separately or cylinders and cones separately. 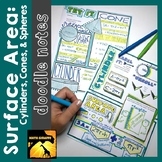 They fit perfectly in a composition book for interactive notebooks or can be used on its own. 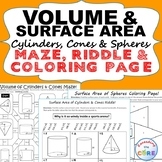 This 9-page document contains vocabulary terms introduced in elementary and middle school pertaining to cylinders, cones, spheres and hemispheres. 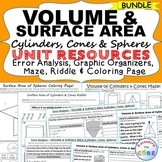 Drawings, definitions, symbols, formulas and nets are included. This material has been used as a mini-course and as summer school enrichment material. Add some flair to your lesson on Pi Day or make any day a pi day with this eye-catching color by number activity! The mixed geometry formulas all require students to calculate using pi. This makes a great review or it can be used just to have your students practice using pi in various formulas.